Trydor Esooniux Scope, was originally an inter-dimensional bounty hunter and tracker. 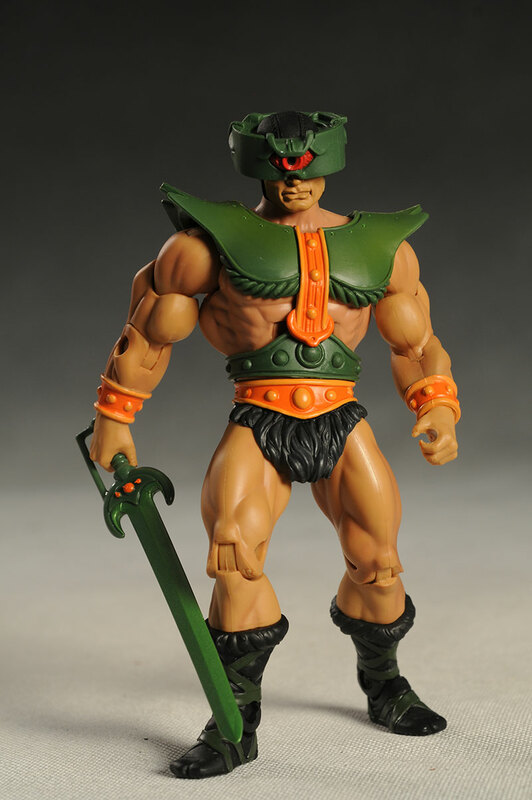 Scope was recruited by Skeletor during one of the final battles of the Great Unrest to bolster his weakened forces. As good with a blade as he is crafty, Scope took the name Tri-Klops after an accident left him blind and he was forced to wear a tri-optic visor which granted him expanded tracking abilities including Gammavision, the ability to see around objects, Distavision, a form of Far Vision, Nightvision, and the ability to generate optic blasts. Tri-Klops uses his three different eyes to spy for Skeletor! Optic Blast: I Cleverly use my Visor in combat and am never considered Unarmed. Gammavision: When I rely upon my Skeletor's Technology, I can Sneakily attack from up to 2 zones away or ignore cover. Huntsman: When I tap into my experience as a Hunter, I can sneakily create an obstacle against an enemy.